The steering wheel was given to me by a gentleman here in Colorado who in his 70's is still building cars and racing. This wheel was off his first dragster which he built and ran from 1959-1963. I plan to run it as well as switch it to a Chassis Research wheel from time to time. Nice progress! Keep it up. You'll be through before you know it. Thanks for the tip FF and I'll revisit that. It doesn't seem to be flexing but I like how you did yours and the idea of some "triangulation" support is always good. I ended up re-doing my seat base - I never liked how high I sat in the car so I took some 1/4" thick steel and bent up some straps. This gets me lower and further forward in the car and is much more comfortable. Next up was a master cylinder and hand brake. 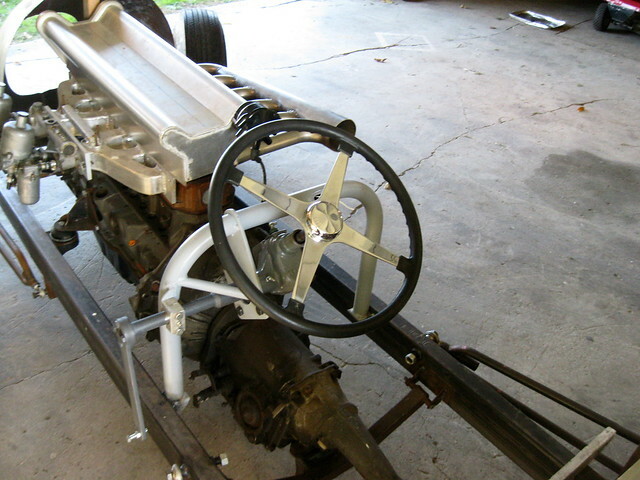 I have a buddy who built a dang nice HAMB dragster and after one season (only 2 races) is parting it out. Sad to see it happen and it's a long story but his partner in the deal wanted out so my pal said "screw it" and parted out a brand new car. I was able to use the master cylinder and calculations (bore size, etc..) worked out. Sometimes you have to push them outside...step back and take a look. Thanks FF and matter of fact my son and I were discussing that very thing. It returns nice now but pretty sure we're going to add a second spring further up the handle. I have been after a Frameworks shifter for a few years now and I was lucky enough to find one here in the classifieds - thank you again Dave. I made a bracket for it and got it tacked in the car. Now I need to measure/order a shifter cable for it but it worked out great. I also picked up a pillow block to move my pitman arm shaft mount further out and it will go under the top bar. The ol' cockpit is starting to fill up.